By Keith Cowing on September 16, 2015 1:00 PM. 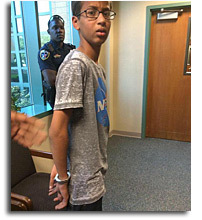 "Police in Texas have arrested a 14-year-old boy for building a clock. Ahmed Mohamed, who lives in Irving and has a keen interest in robotics and engineering, put the device together on Sunday night. When he took it to school the next day, he was pulled out of class, interviewed by police officers, and taken in handcuffs to juvenile detention, after being told by teachers that his creation looked like a bomb. 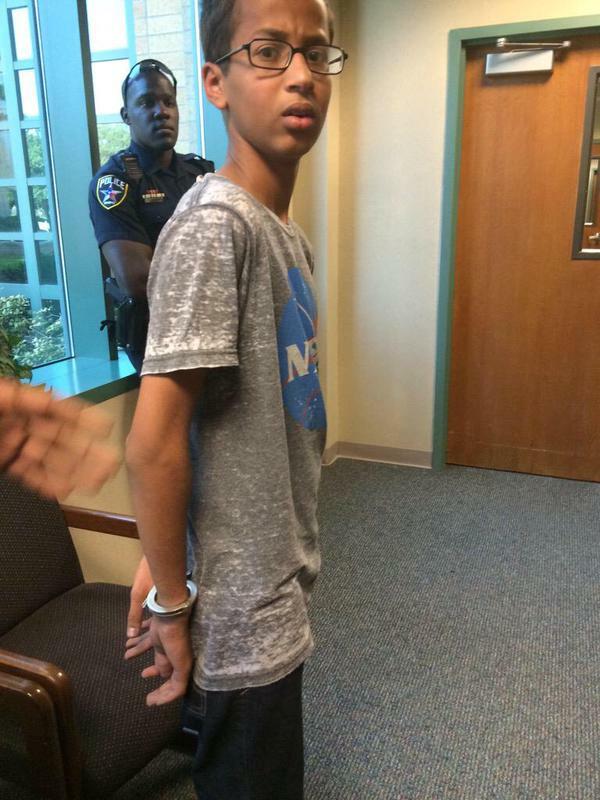 A picture reportedly taken by Ahmed's sister shows him in handcuffs at the juvenile detention center, sporting a NASA T-shirt and an understandably confused expression. Ahmed was fingerprinted, before being allowed to return home, but is still serving a three-day suspension from school." "Ahmed Mohamed who makes his own radios and repairs his own go-kart hoped to impress his teachers when he brought a homemade clock to MacArthur High on Monday. Instead, the school phoned police about Ahmed's circuit-stuffed pencil case. So the 14-year-old missed the student council meeting and took a trip in handcuffs to juvenile detention. His clock now sits in an evidence room. Police say they may yet charge him with making a hoax bomb though they acknowledge he told everyone who would listen that it's a clock." This page contains a single entry by Keith Cowing published on September 16, 2015 1:00 PM. Is Positive Change Coming to Canada's Space Program? was the previous entry in this blog. NASA Delays First Crewed Orion Flight By Two Years is the next entry in this blog.